If you love and collect wines, you accept early on that the affair is by necessity a waiting game. Wine must age. That perfect Bordeaux in the basement can't be uncorked too soon. Sometimes, though, wouldn't it be all right to just skip ahead a little? The answer is yes, if you know about bottle sizes and what they can do to aging. Here's the trick: wine ages a bit faster in smaller bottles than in the standard and larger counterparts. Want to try that five- or ten-year selection a little ahead of time? Put up a piccolo or a half along with the standard-sized bottles and you can give it a go a year or two before the bigger bottles are ready. Wait, you say, what's a piccolo? How is it different from a half? Let's take a look at some of the most common sizes in which wine bottles come. 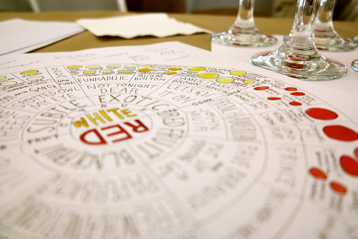 It's a fascinating exercise itself, as the nomenclature is as rich as the vintages they hold. Here's the scale of sizes when it comes to bottles of wine. In the list, if there is more than one name given, then they refer first to alternatives for a bottle of still wine. The last name given refers to bottles from the Champagne region. Piccolo/Split/Pony: These are quarter bottles, .1875 liters. Half Bottle: Exactly what the name implies — .375 liters. Magnum: The equivalent of two standards, 1.5 liters. Double Magnum: At 3 liters, this is two magnums large. Jeroboam/Rehoboam: About six standards in one 4.5-liter bottle. Imperial/Methuselah: A 6-liter bottle, or eight standards. Salmanazar: Twelve standard bottles worth — 9 liters. Balthazar: A 12-liter giant, 16 standards large. Nebuchadnezzar: 15 liters, or 20 standards. Melchior/Solomon: The equivalent of two whole cases of standards, 18 liters. Goliath/Paramount/Primat: The titanic of the bunch, 36 standards (three cases!) at 27 liters total. A rule of thumb on how this size trick works is this, according to Wine Spectator: if the range for aging a bottle is 2–5 years, then your piccolo or half bottle are probably good bets to open in the 24-month range. Larger bottles need more time to age than less, so if you end up storing a melchior or goliath, they'll be ready when the grandkids are old enough to try a glass!